Cyberpunk comes to the big screen in the form of a post-apocalyptic roller derby. I would not have guessed that’s how it would go. Alita: Battle Angel is, among other things, director Robert Rodriguez’s best film in years. That isn’t saying a lot, but the truth is that the filmmaker does more with dystopian YA heroine tropes than most recent directors have. In a terrestrial wasteland in the shadow of a sky city eternally out of reach, one kindly scientist (Christoph Waltz) scrounges a scrap heap looking for cyborg parts. He rebuilds something he finds there—something that reminds him of his own lost daughter. 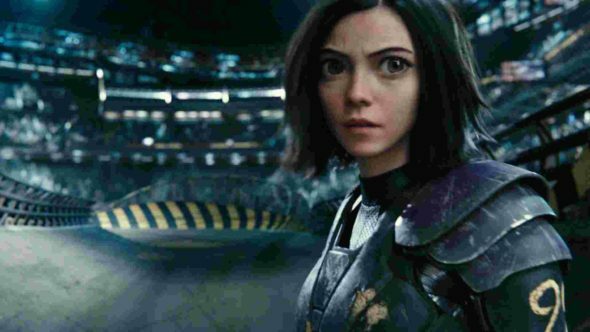 Though Alita (Rosa Salazar plus motion capture magic) has no memory of who or what she was, her instincts oscillate between earnest adolescent and battle-honed killer. Based on a Manga series about a bounty hunter, Alita concerns itself more with the themes of today’s young adult franchises: empowering young women to be true to themselves, stand up to authority, own their own destiny, and only crush on boys who love you for who you truly are. All fine lessons. A stocked supporting cast including two more Oscar winners (besides Waltz)—Mahershala Ali and Jennifer Connelly—elevate the sometimes threadbare dialog with sheer will and undeniable talent. The film also showcases the latest cinematic tech wizardry at the disposal of co-scriptor James Cameron, wielded by Sin City’s visionary helmsman. And it looks great. Better than the trailer makes you think it looks. The ruined city, the cyborg monstrosities, the action—all of it commands attention and refuses to be dismissed. If nothing else, Alita absolutely marks a departure from the filmmaker’s traditional style. Indeed, it looks more like something Cameron would make: glossy and epic versus edgy and idiosyncratic. There is nothing especially groundbreaking or memorable, however, about the film. There is nothing inferior about it, either. It pushes some boundaries in terms of content as well as movie experience and it entertains from start to finish. It’s Hunger Games with a more likable protagonist, Ready Player One with a plot. It’s forgettable, cool looking and fun. Ready Player One had a plot, not sure which film you were watching.